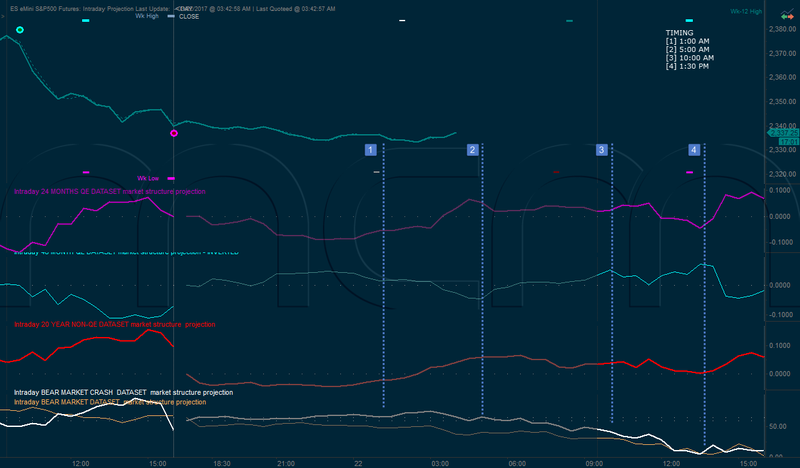 Today's data consists of Jobless Claims and Producer Price Index at 8:30AMEST, Bloomberg Consumer Comfort Index at 9:45AMEST, EIA Natural Gas Report at 10:30AMEST, and the Treasury Budget at 2:00PMEST. The technical picture has us up against declining resistance after cleanly bouncing off the 5DEMA as momentum players stepped back into the fray. Given the current overnight price action we are currently marginally above the declining support but it is premature to read into that too much because price can do a lot of things between now and the opening bell. Until a close below the 5DEMA buyers still have a firm grasp on overall market direction, and a break of the declining resistance would give more validity to that fact remaining valid. The 2725 to 2530 zone will still be a solid area of defense for buyers should the sellers be able to push price down even further. Good luck today! Last week was the most bullish one in quite a while. Tuesday put in a low in the o/n on the North Korea missile test news, but from there the bulls did exactly what they needed to. They defended the previous week’s lows and moved up never looking back. They also managed to overlap 2475 which negates the most bearish scenario (a nested sequence on the downside). 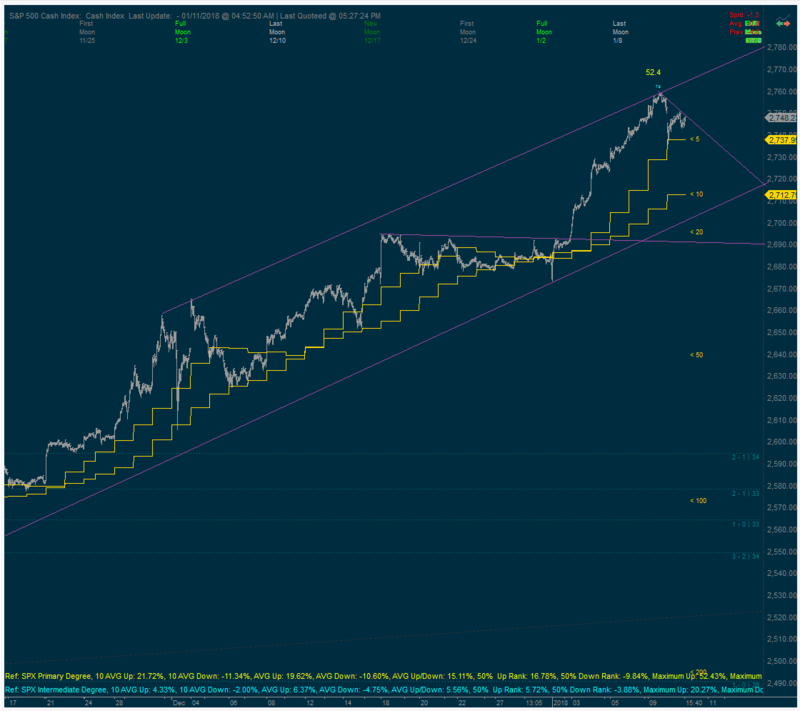 So while that seals an 3 wave move off the ATH, the bears do have one more option as far as EWT goes. And that is a (yet another) flat. However, there is quite a lot to be done before that takes shape (namely that 2455 is overlapped before this develops into a 5 wave sequence), so the bulls have to be viewed as favorites at this point. On the weekly cycles, the mcm-MA continued to provide support and market bounced yet again from there. No sign of a support bullish retrace (BR) just yet. The supports on the daily cycles held nicely and directionality also bounced. Bulls did what they needed to and avoided a potentially very dangerous situation (an impulse down). The market continued the bullish momentum and pushed to new ATHs after a brief pull-back into mid week. The high of the week was reached on Thursday, with Friday seeing a retreat from there. Like we were saying last week - the bulls are favorites and in this environment it’s very hard (and risky) to call a top. The near term EWT option the bears still have is for this to be a B wave (off the low at 2405). And if that’s what this is, then there are enough waves for it to be complete. Of course, there are also a lot of bullish options out there, so the B wave is far from being favorite. That would change with an overlap of 2440, but that seems very far away right now. No new development on the weekly cycles. Directionality is starting to creep back up, which would be very bullish if it made it to the maximum level. The daily cycles triggered corresponding resistances to the supports of 2 weeks ago. ES managed to spike slightly above that, while YM has respected it so far. The normal expectation now is for the market to retreat from the said resistances. In fact YM looks to be doing just that with directionality tilting lower and not being able to push past resistance. The market it making history again making fresh ATH and closing very near them on Friday. It seems that the 3 waves decline we were mentioning last week (with the low at 2405) was all that it was, since we held that low and made new highs. Of course this can still be a B wave of a flat and if the market were to stop close to where we are and head down strongly, it would add weight to that scenario. But this option has to be viewed as the underdog now, so bulls are yet again favorites. Nothing new to report on the weekly cycles. Directionality is worth keeping an eye on for early clues. We mentioned that it’s behavior was not bullish, but given this rally, that might change. The daily cycles provided an early warning to this ramp. Both ES and YM had supports triggered. ES canceled the nested up impulse, by having support trigger just below the previously broken resistance. While YM confirmed the up impulse and had a bullish retrace (BR) support. Both those supports held and were pointing up, at least until corresponding resistance level trigger. The market pulled the old “W” pattern last week, making a low on Monday, then bouncing back up to test the ATH (which it missed by 3 points), then moving in lower again to (barely) take out Monday’s low before bouncing once more. From an EWT standpoint this sideways action might be a wave 4, which means the bull count is still alive and well and still the favorite. That continues to be the case until the market will overlap the 2398-2402 area (depending on which high you consider the top of nested wave 1). Same as for quite a while now, the weekly cycles do not show any significant change. However it is interesting to note some aspects. Namely, the mcm-MA on these cycles provided support several times when it was tested from above. Also, both YM and ES are in up impulses which are now firmly established so would normally need a regular unwind, with a bullish support (BR) and corresponding END resistance to dissipate the up energy. The daily cycles are also in nested up impulses and recently broke yet again above resistance, breakout which would soon turn into another nested up impulse, unless the market reverses strongly. In fact YM will confirm in the next few days, as the mcm-MA is now crossing over resistance. Weekly cycles are unchanged, with directionality still at the lowest level despite the bounce. Once that moves, it would be a confirmation that the up move is really bullish. On the daily cycles we saw a support level trigger also on ES (following YM). The up impulses are continuing to unwind and the next resistance levels will be very important to watch for reaction, especially since it will be a 3rd END on ES, marking the completion of the impulse. The market didn’t do much of anything last week, probably trying to prove that sideways is also a direction. We did get a higher high vs the previous week on Wednesday, but still finished the week lower. 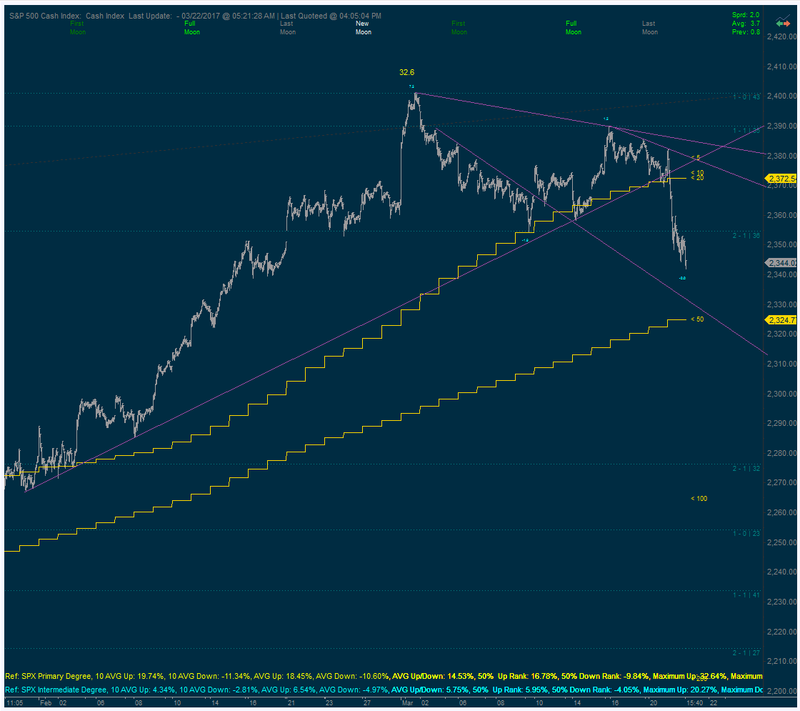 No change in our EWT (short term) scenarios - we still have a 3 wave correction from the ATH and the current bounce overlapped the 1st wave low, so the current move should continue to new ATHs, unless the bears turn this into a nested move down. The low close to 2320 is the level to beat for bears, while overlapping 2390 would more or less guarantee the bulls that new ATHs are coming. No change on the weekly cycles. Directionality continues to move lower. The daily cycles have the bullish retrace (BR) supports in place which have held the decline so far. Directionality is still stuck at the minimum level, so once it bounces we would be on the look-out for an END resistance higher. The last week of March saw the bulls come back from being a bit on the run the week before. Monday saw the market make a new low and spiked below the 50 day MA. However the bulls quickly recovered and not only did they win back the 50 day MA on an intra-day basis but the market rallied the next 3 trading sessions. Only Friday saw the bulls give back a bit. Continuing our EWT (short) analysis, the larger 3 wave correction we were mentioning got the new lows and then rallied, as warned. The rally overlapped the 1st wave low, so unless the bears turn this into a nested move down, the current move should continue to new ATHs. No real change on the weekly cycles, but an interesting fact - the mcm-MA provided support, just as it did on the daily when it was first tested. Directionality continues it’s move down and would be interesting to see how it behaves going forward. An important development on the daily cycles: a bullish retrace (BR) support triggered at Monday’s low, adding weight to the assumption that the said low is important. Normally an END resistance higher is expected but for where that might show up we need to take a look at the shorter term cycles. Good morning everyone. Currently the red and magenta MSPs are tracking the best through the overnight so look for choppy marginally upward biased price action on the day. Data is light again today with the FHFA House Price Index at 9:00AMEST, Existing Home Sales at 10:00AMEST, and the EIA Petroleum Status Report at 10:30AMEST. The technical picture saw us put in our first 1% down move for 2017 ripping through the shorter timeframe DMAs and the intermediate minor level at 2355. We currently sit at symmetry for the move down from the all time high with the first leg being 1.9% and this current leg being 2% as marked by the cyan intermediate pivot markers. This current leg is searching for a bottom denoted by that same cyan pivot marker, so sellers need to be careful. This fact coupled with both systems taking long trades at the close yesterday gives decent probabilities to a bounce of some kind in the very near future. Good luck today! Inflection point Data market internals Tool Number market structure projection Earnings Tools Bank Probability Psychology Central bank Emotion Tick Fact Expert Lounge Mathematical analysis Behavior Future Tick Tools Analytics MCM Forecasting GOLD S&P500 Stock market Cycles MSP analysis Algorithm ES_F Understanding ES commentary Greece Observation Risk US intraday market Bias Levels market structure markets .